The NBA Summer League is one big family that will continue to grow every year. For this weeks Staff Spotlight we had the opportunity to catch up with Devin Dismang. Devin has been with the Golden State Warriors for 4 years now and has been able to rise to the top through hard work and dedication. He started working in game ops and thanks to his tireless work ethic taught himself the necessary skills to become a producer. Devin is currently a lead producer for the warriors and won an Emmy for the work he did during the 2016-17 playoffs. Q: You have been a staple at NBA Summer League for years. Tell us about your experience as part of the staff. 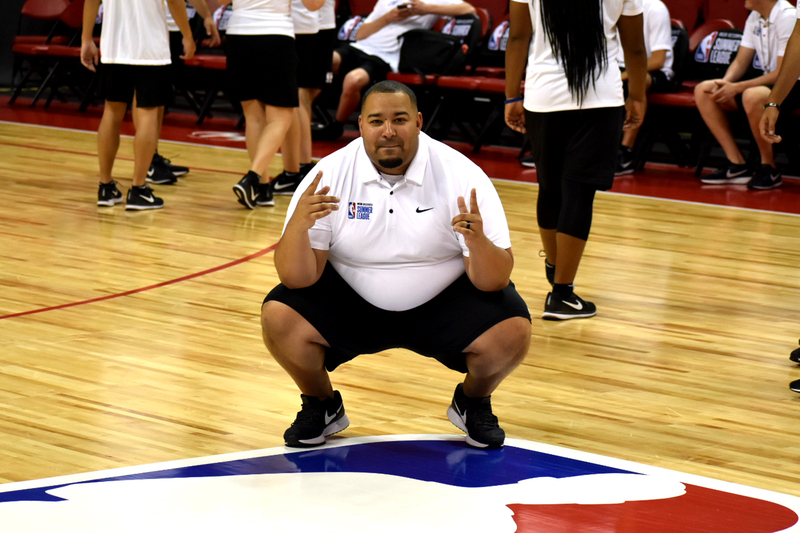 I never really considered myself a ‘staple’ on the staff as I think everyone on the staff brings their own unique personality and swagger to Summer League each summer. The experience at Summer League has truly been an incredible one and something I look forward to every year. Getting to continue to hone my craft while teaching others is something that is rewarding to me. Along with that, we have a lot of people who may have connections or names to some big-time folks in the industry but when we clock in for another day of games at T&M, we all are after the same goal – which is to put together one of the finest basketball products day in and day out. Biggest thing I learned is humility and having the ability to adapt will get you far in this industry. No one is ‘too good’ to do any job. Picking up trash, selling programs, throwing t-shirts, grabbing waters, etc. – hard work is hard work and people notice it. 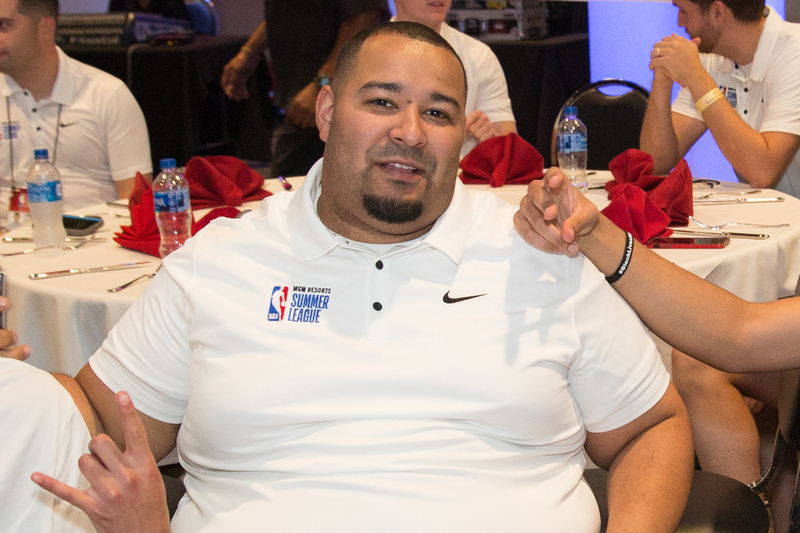 Along with that, Summer League is one of the most hectic events from a staff side but for the NBA folks, it tends to be more laid-back than an All-Star Weekend because we make sure to provide that sort of experience. When people get that experience, they feel more open to talk to us as staff and get comfortable, and that’s where several folks have been lucky enough to make connections and find a full-time job from that experience. So as Summer League – you never know what can happen! Just have to be ready when and if the opportunity opens up. Q: You now have a job with the Golden State Warriors what is your title and what are your day-to-day responsibilities? I am the Lead Coordinating Producer for the Golden State Warriors. My main responsibility is to create unique, fun and insight content around our players, coaches and organization. I produce video content for our social media channels, web channels, television and in-arena videoboard experience. Because of this – my job requires me to travel with the team and get to know them pretty in-depth and personally to find stories and make them comfortable telling them on camera. I also act as our department’s ‘Project Manager’, where I make sure that other video content being created by other members on our Studio team is up-to-par to our company standards and are meeting deadlines set. Finally – I manage our part-time Production Assistant Program, where we bring in a group of 12 recent college graduates to gain experience in a sports video production environment. I would say my favorite part of my job is a combination of the obvious: getting to know these players on a personal basis and being able to travel. I’ve always wanted to travel in my profession and being able to do it with one of the most storied NBA teams in history is a once-in-a-lifetime experience. Also – the most rewarding part was this past season as our Studio team and I won an Emmy Award for one of our TV shows highlighting our 2016-2017 championship run. It was an amazing accomplishment for our team who continuously works hard to create some of the best content in the league. As an Executive Producer of a sports team’s video department or a player-owned content company (like Uninterrupted or Player’s Tribune). I’ve been able to relate with athletes during my time in sports and it has allowed me to tell some incredible stories. I am hoping to continue down this path to where I can create more in-depth, ‘behind the fame’-type stories with these folks who are always in the spotlight. Get in the industry EARLY. Apply for internships/part-time gigs while in college and make time to learn about the industry. I’ve always said that ‘experience is more important than schooling.’ I’ve met way more people in the industry with bachelor’s degrees who have years of experience versus someone who’s gotten a master’s. Also – this will show you how much sports are truly a grind and not glamorous as many may think. It’s long hours and working weekends/holidays. I’ve got several. Dwayne “The Rock” Johnson, Kanye West and Dwyane Wade. All three may be in different fields but all three created a path for themselves out of nothing and made themselves something. Along with that, they all are multi-faceted from a business/creativity side when the rest of the world wanted to box them into one industry/talent. I work out every morning to start my day off right. I also play music every morning while getting ready. Also making sure I walk my dog before heading off for the day. Nah, not really. To be honest – I don’t read too many real books, but I need to get back into it. Biggest hobbies would be playing video games, reading comic books and Netflix and Chilling. “If they don’t know your dreams, then they can’t shoot them down.” – J. Cole. Heard this while in college and at the time, I was around a lot of folks who would rather see me fail than succeed so I kept my mission to succeed close to the vest. Just something that’s always stayed with me since I heard it.